If you have ever been confined to a wheelchair for any length of time, you recognize the problem with encountering obstacles. 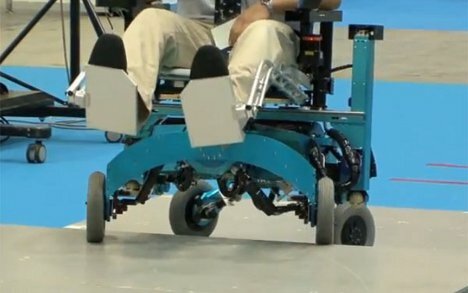 This robotic wheelchair designed and built by Chiba Tech incorporates wheels that can act as legs when the terrain is rough or when an obstacle prevents smooth rolling. Like any wheelchair, it works best on even, paved ground – but unlike other wheelchairs, it also has sensors at the bottom to detect any upcoming obstacles. It is controlled by a joystick on one of the user’s arm rests. As the wheels step over objects in the robot chair’s way, the seat also adjusts to remain level, ensuring that the rider is not needlessly jostled about. When needed, the wheels can line up and extend stabilizers to the sides, then turn around to face the other direction. This might be the easiest way ever to turn a wheelchair around. The creators of the robot wheelchair haven’t yet tested it with potential users, but their initial movement tests seem to indicate a device that is both versatile and highly mobile – it’s a clear improvement over even the most advanced motorized wheelchairs currently available. See more in Robotics or under Technology. October, 2012.